Jeffrey Bruma started in the youth academy of Feyenoord Rotterdam but moved to England at the age of 15. Then Jeffrey van Homoet Bruma turned pro in the summer 2009 and became a Dutch Under 21 international in September 2009 at the age of just 17. Bruma frequently trains with the first team and made his debut as substitute a Premier League win over Blackburn in October 2009. He received also his first U21 call-up in 2009 for the Dutch team. Chelsea’s teenager defender Jeffrey Bruma has agreed a new contract in August 2010, which will keep him at the club until 2014. The 18-year-old, who made his full Netherlands debut in the summer, is highly regarded at Stamford Bridge, having been with the Blues since 2007. In February 2011 Bruma was send on loan to Leicester City until the end of the season. The clubs already agreed a loan deal at the closing of the transfer market, but Chelsea were too late to arrange the necessary papers before the closing. However, a few weeks later the loan deal was still allowed because Leicester was playing in a lower league. At the end of his loan period at Leicester, he was send out for another loan deal by his club Chelsea. He signed for 2-year at German Hamburger SV until June 2013. 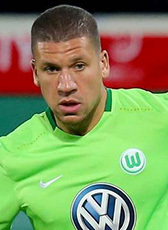 Jeffrey Bruma moved away from Chelsea in June 2013. He signed for PSV Eindhoven, a return to the Netherlands. The Under 21 Dutch international signed a 4-year contract. Transfer fee is around the 2M€ for the talented defender. Because of health doubts, the transfer was finally sealed in July. After three successful seasons in Eindhoven winning the Dutch league twice, Bruma went for another international move. He rejoined the German league signing a 5-year contract at Vfl Wolfsburg. His contract until June 2021 was signed for a transfer fee of 11,5ME. In January 2019 he was send on loan for the rest of the season to Schalke 04. His brother is Marciano Bruma who also played abroad in England.